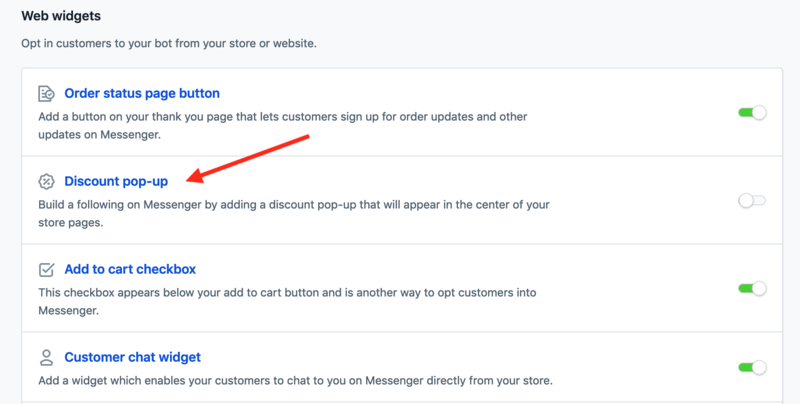 The discount pop-up is a widget that offers your customers a discount code if they opt-in and subscribe to your bot. 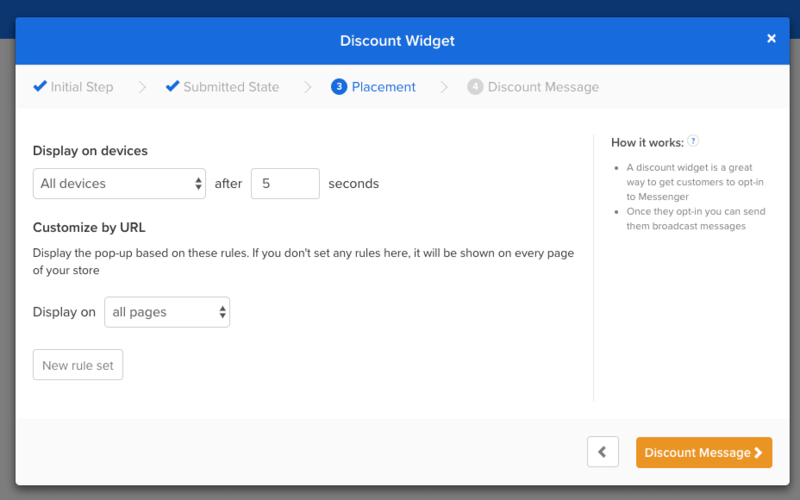 In order to turn on the discount pop-up simply go to the Home page scroll down to Web Widgets and click on the discount popup, add discount code and if you wish customize popup wording. How do I create a discount code for my pop-up? You should create a discount code directly on your Shopify store. Here is a Shopify help article on how to do that. What message will users receive on Facebook Messenger after they click the "Get this in messenger button"? Users will receive the default message with the discount code. You can see and edit that message in the last step. Can I display the pop-up only on desktop? You can choose on which devices you want to display widget. You can also choose how long after a customer arrives on your store you want the pop-up to appear. You can edit that in the placement step where it says "Display on all devices"
What if I want to customize the pages where the discount pop-up appears? 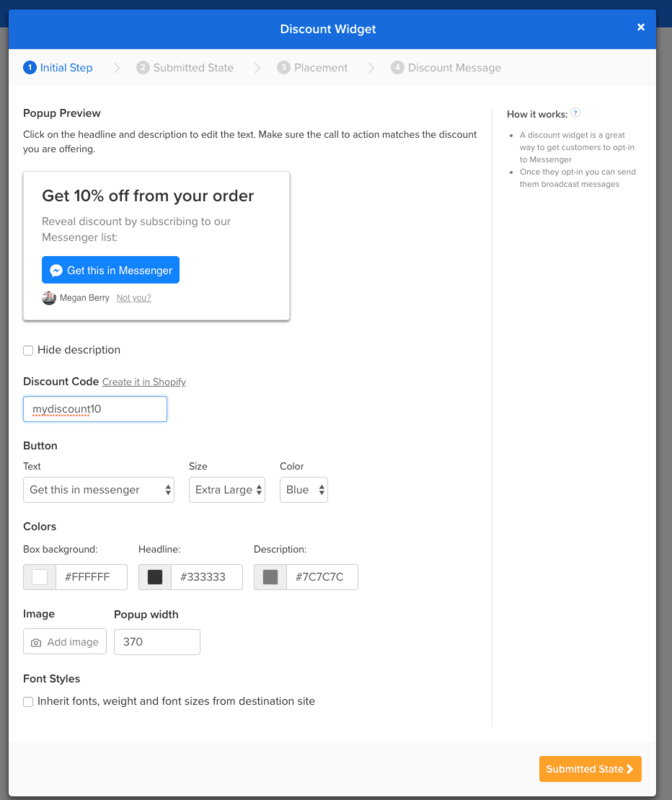 On the placement step, you can easily customize which pages your discount pop-up appears on. 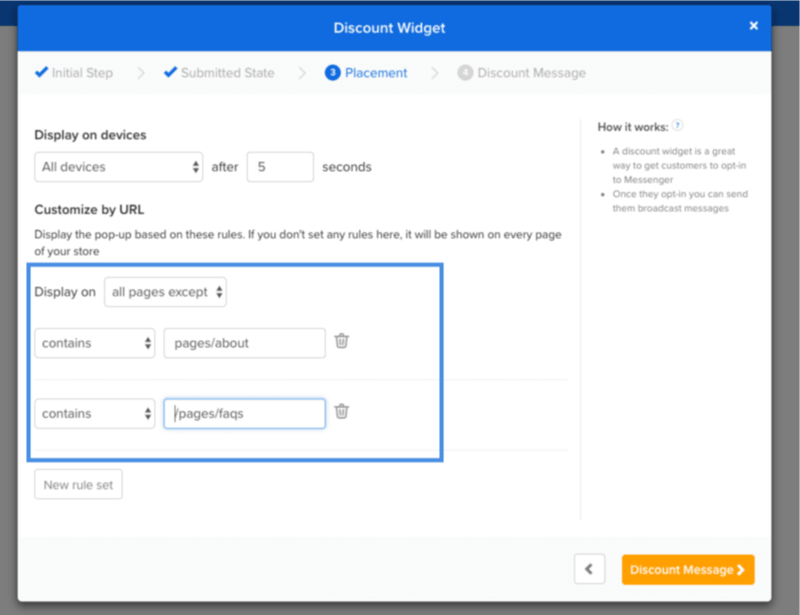 Choose whether you want to display on all pages (the default), to identify certain pages to exclude or to only display on a selection of pages. If you want to target by your your home page, enter your full domain. I.e. https://www.example.com. When should I use the discount pop-up? What if I'm already using another pop-up provider like Justuno or Privy? We do have integrations for Justuno and Privy pop-ups. You can definitely use your existing pop-ups built with those platforms and extend them instead. Learn more about the Privy integration. Learn more about the JustUno integration.